November 17, 1978 -- As the flagship station for the National Broadcasting Company, WNBC is expected to exemplify world-class quality and creativity in its programming and news. In its newscasts, the station does this job admirably using snappy writing and a professional, upbeat delivery. Hear how WNBC newscasts sounds in 1976 and 1978, plus an interview with WNBC news director Meredith Hollaus. WNBC delivers news in a creative, breezy style without devolving into inane "happy talk." Newscasts are usually presented with a conversational tone, and may feature dialog between the newscaster and the jock. But, this is still NBC. Humor and lead stories don't mix, and (in contrast to competitors such as 99X WXLO) any outright joking is usually reserved for near the end of a newscast after the more serious business is out of the way. Following this tricky recipe, WNBC has managed wrap its news in a friendly, approachable package and yet remain credible to listeners as a news delivery organization. "Newscasters, I think, should be more conversational," reflects News Director Meredith Hollaus. "People don't want to listen to somebody preaching to them. You should tell a story to the audience the same way you would tell an event that happened to your parents, to your friends, to the guy sitting next to you on a barstool." JOCK: Charles McCord now, at 7:27. . .
McCORD: And it is election day, a well-publicized fact that is expected to be largely ... ignored. Today's elections are expected to attract a very light voter turnout, with the likelihood of rain predicted in the East and Northwest. Voters... thought to be discouraged about their choices... disenchanted with government at just about any level you care to mention... and so, apparently adopting an attitude that it just doesn't make much difference which candidate of which party wins. Hollaus says a good newscast should probably not run much over two minutes. But she says during morning drive people hunger for more information so the newscasts are longer then. "[People in the morning] should know what's happening; what has happened during the night that they need to be aware of. They need to know about traffic, weather, and how they should dress for the day. And also, what may be going on during the day what they may want to find out about later on when they listen to the news." How much news is the right amount? "It all depends on the type of programming you're doing," Hollaus says. "If you're doing news/talk, obviously you're going to have much more news than you would if your programming is basically rock. I would say that you should have a newscast every hour. People seem to like their news straight up on the hour, because they're used to it." At the top of the hour, the local newscast hands off directly into NBC Radio News. And, to hit the network, the timing has to be exact to the second. WNBC news anchor Sam Hall prepares an afternoon newscast. "We get a tone from the network, and that lets us know the network is coming up," confides Hollaus, detailing the logistics. "We then conclude our local newscast. We have seven seconds to tease into the network, name the network newscaster, and tease his first story... so that also gives us continuity. It lets our audience know that we're aware of what the network is doing." Of course, because it's NBC owned and operated, WNBC is in a special position of being able to call the network news desk just before the hour to find out the lead. "Usually [we do this] as close to airtime as possible, because lead stories can change very quickly, especially with a breaking story," says Hollaus. This complex hand-off is a bit of a high wire act for the WNBC newscaster, writers and engineer, which is why the station hires seasoned professionals. "It takes a newscaster who's awake," says Hollaus bluntly. "You need somebody who's able to read a clock, and knows how to ad-lib. Sometimes you have to ad-lib out of your local newscast; you may have a long story and you have to shorten it very quickly if you know, say, you only have ten seconds left in your local newscast." Despite the breeziness and familiarity of the writing and delivery, WNBC's newscasters and news management are sticklers about using proper grammar and pronunciation. "We don't use any slang," affirms Meredith Hollaus. "We use good English, and good grammar, and there's no excuse for not doing that." "We'll accept informality, as long as it's not blatantly vulgar," says morning editor Bill Maher, of the station's easy-going style of delivery. "We're not after a gum-chewing image." Beyond good writing, WNBC believes the right newscaster (for example, Charles McCord or Sam Hall) can really make words come alive. "You just can't beat good writing, and good presentation," says Meredith Hollaus. "However, if you could only have one. I'd say good presentation would be more important than good writing. You can have the best written story in the world, and if the newscaster is dull and boring, that's exactly what he's going to communicate to the audience." grab their attention with his voice, and it makes a lot of difference." 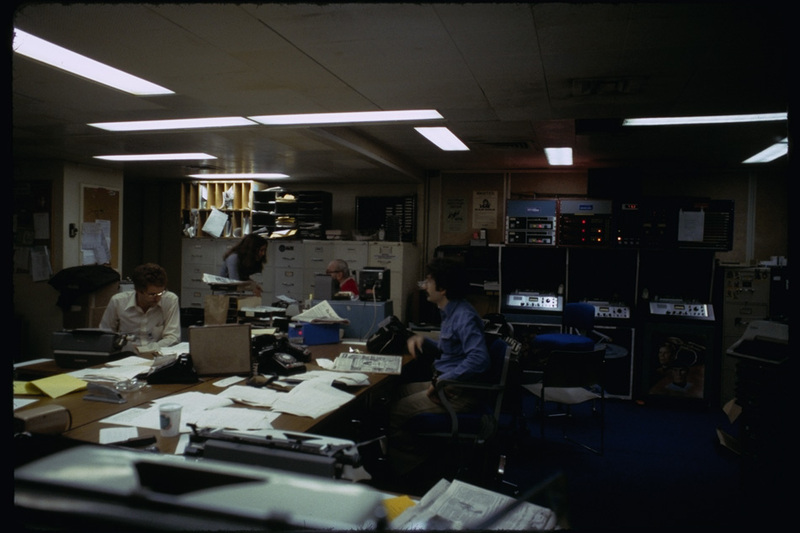 WNBC Picture Gallery - Pictures of the WNBC newsroom and personnel, including Charles McCord and Sam Hall. WNBC News Format - Broadcast news format from typical morning, Fall, 1978. WNBC Schedules - News schedule and rundowns from a Fall, 1978 morning. 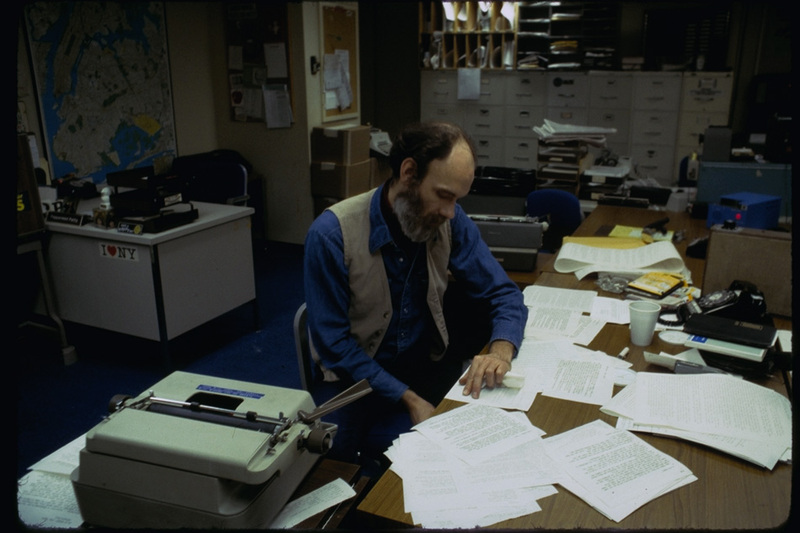 WNBC Datasheet - "The news department here now is not nearly what it once was," complains one of the several engineers who work the morning shift. He is referring back to the days when WNBC's sister FM station was an all-news operation, and money ran more freely. Yet WNBC is one of the city's larger departments. With six reporters/writers, and two editors, the station has a larger news staff than several other well-known stations. This datasheet gives stats on staffing, wires, cart machines, and much more! Visit more stations - Back to the home page to visit more stations' news departments. WNBC Anchor History - A partial chronology of anchors and personnel at WABC, from Bill Dulmage's site. WNBC Tribute Page - A tribute to the past glory of 66 WNBC. This research documentary is Copyright 1979, 2003 Martin Hardee - All Rights Reserved. (read more...) Material may be quoted or excerpted for non-profit research purposes without additional special permission. For additional information email martin @ hardee.net.